It’s possible to choose the copy source volume in case the files have multiple backups registered in the Project Library. Selecting the fastest source volume generally increases the copy performance, depending on your hardware. Silverstack by default copies all the clips and files contained in the Folder or Bin you previously selected to backup. If you just need to offload a subset of clips, you can check the ‘Allow partial offload’ checkbox. Clips can be marked and unmarked either by using the checkboxes or the ‘mark’ and ‘unmark’ buttons by the ‘search’ field. Therefore either select all clips you’d like to import and then click on ‘Mark Only Selected’ or select those clips of all already marked that shall not be imported and click on ‘Unmark Selected’. As you can see in the following image, there is a bunch of keyboard shortcuts for marking (#1) and unmarking (#2) clips to facilitate this task. 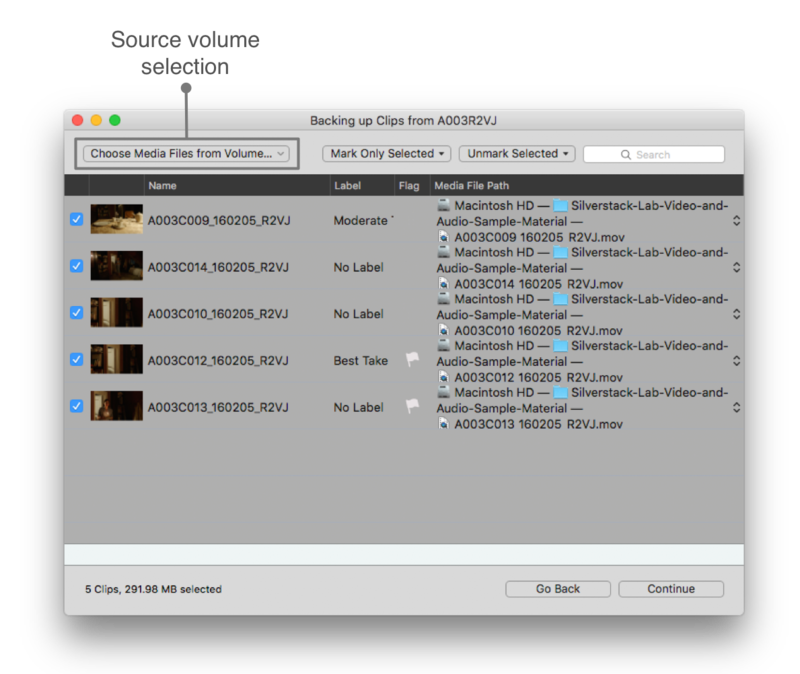 In this section you are able to choose the destination volumes to which Silverstack will copy the clips and files. To edit the import options, click on the ‘Edit’ button. The number of volumes that Silverstack can simultaneously offload to is only limited by your hardware. Adding a new destination is done by pressing on the ‘+’ button on the lower left of the table. Click on the ‘-‘ button next to it to if you’d like to remove the selected destination drive. In relation to the additional options under ‘Verification Behavior’ and ‘Checksum Method’, you can find a detailed description of each one of those settings in the article The Copy and Verification Process in Silverstack: Verification Behavior. There is also the possibility of using the Path Wildcards feature, which offers users a way to create custom folder structures based on the metadata contained in clips. 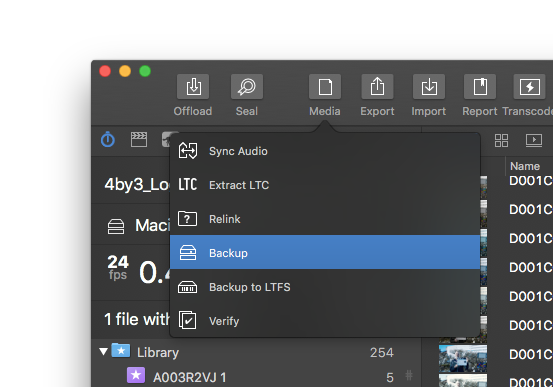 After determining your copy destinations and settings, click on ‘Backup Files’ to start the copy process. All the information about the backup process can be supervised in the Jobs panel.